Make Soap Maker's Home Page the Default Home Page. Will your cold process soap be cured in time to ship to customers for Christmas? Most people who purchase gifts online make their Christmas purchases from November 9 - 12, which is Veterans' Day weekend and several weeks earlier than "Black Friday." If your cold process soap takes five weeks to cure and dry, then you should have most of your Christmas soap made by early October (or sooner) to have the bars cured and ready to ship in early November. Will you have enough soap ready to meet increased sales for Christmas? Most soap makers report their average monthly sales double for Christmas. To determine if you're ready, first figure your average number of bars of soap sold per month, which is the total number of bars sold in a year divided by 12 months. For example, if you sold 500 bars of soap last year, your monthly average will be about 42 bars because 500 bars per year ÷ 12 months = 42 bars per month. Next, multiply the average bars per month by 2. In the example, 42 bars average per month × 2 = 84 bars in projected sales for Christmas. Will your soap be delivered to your customer in time? Soap must be shipped by Wednesday, December 19, to guarantee it will arrive by Saturday, December 22, 2018. If you ship Christmas soap later than Wednesday, December 19, caution the customer the soap may not arrive before Christmas and suggest expedited delivery solutions, such as Priority Mail Express®. Remember, just as you're winding down from Christmas and feeling a sense of accomplishment, Valentine's Day seems to sneak up out of nowhere! Similar to the deadlines for Christmas (above), customers tend to make online Valentine's Day purchases during the Martin Luther King Jr. Day holiday weekend. Therefore, to have soap ready to be shipped during mid January, you must have made the cold process soap during the second week of December! When making soap, accurate measurement is essential. Too little or too much of an ingredient can ruin the soap. Most soap makers agree it is a good idea to convert all ingredients to a consistent unit of measurement, such as measuring all ingredients in ounces or all ingredient in grams. How much should you charge for a bar of your handmade soap? The most common mistake made by soap makers (and all crafters) is under pricing or not charging enough when selling soap. How can you be sure you've set a price high enough to meet all of your expenses and allow for a profit without over-charging? There are two formulas to determine how much to charge for a bar of your soap. Use the first formula to calculate the price of soap to be sold wholesale and the second formula to calculate the price of soap to be sold retail. Generally, wholesale pricing is used by soap makers who sell soap in large quantities or who sell soap to businesses that will re-sell the soap. Retail pricing is used by soap makers who sell their soap directly to the public. First, determine the entire cost of the ingredients for one bar of soap. In other words, how much did you have to pay for all of the ingredients to make one bar? Add together the cost for the amount of fat to make one bar, the cost for the amount of oil to make one bar, the cost for the amount of herbs to make one bar, the cost for the amount of colorants to make one bar, the cost for the amount of scents to make one bar, the cost for the amount of lye to make one bar, the cost for the amount of water to make one bar, and the per-bar cost for anything else that is in the soap. Do not include any labor or packaging costs, not yet. Second, add the cost for the amount of labor to make one bar of soap. If you make 40 bars from each batch of soap, determine the amount of time to measure out ingredients, to make the soap, to cut the soap, to stamp the soap, to label the soap, and to wrap the soap; this equals the total amount of time needed to make and finish 40 bars of soap. Then, divide the total amount of time by 40 to determine the approximate amount of time per bar. Third, add the cost of packaging materials for one bar. Packaging materials include soap labels, ribbons, and decorations. Do not include any materials used for the purpose of shipping, such as bubble wrap or shipping boxes. Last, add the cost of ingredients for one bar, the cost of labor for one bar, and the cost of packaging for one bar. Then, multiply the sum of all costs per bar by 2.35 to determine the wholesale price. To determine the retail price of a bar of soap, first calculate the wholesale price (above) and then multiply the wholesale price by 2. What is a profit and how much profit do you make per bar? Gross profit (also called "sales profit") is the difference between revenue (total sales) and the cost of production, before deducting overheads, payroll, taxes, or interest payments. Simplified, gross profit per bar is the difference between the total cost per bar and the sale price per bar. Successful businesses aim for a gross profit of 50%. To determine your gross profit per bar, divide the gross profit per bar by the sale price per bar. This is a simple and very effective method to use to set up the price structure for your bars of soap. However, "gross operating profit" refers to the gross profit from all sales for a specified term. Also, further calculations must be done to determine operating profit, net profit (pre-tax profit), profit after tax, and retained profit. These types of profits require subtracting the cost of overheads, payroll, taxes, interest payments, and dividends. Most soap makers advertise, in some form, to sell their soaps. Handmade soaps are a special treat and are very enjoyable but most consumers habitually purchase commercial soaps at their local grocery store. Handmade soap makers need to fight for their fair share of the soap market by educating the general public, by explaining why handmade soap is better than commercial soap, and by frequently reminding the general public. It is the goal of the Natural Soap Directory™ to meet the needs of handmade soap makers by providing advertising for handmade soap, by educating the general public about the benefits of handmade soap, and by reminding people handmade soaps are better than commercial soaps. 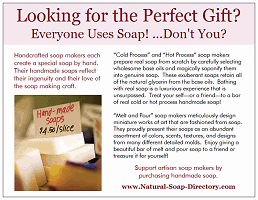 The Natural Soap Directory™ uses members' listing fees to purchase advertising space on Google and Yahoo, to print and mail thousands of postcards promoting the sale of handmade soap, and to print promotional stickers thanking people for choosing handmade soap. Become a Natural Soap Directory™ member and let us help drive more traffic to your soap website. Happy soaping and the best of luck selling your soap! Search for handmade soap terms, topics, and products. The Soap Maker's Home Page was last updated on October 12, 2018.